The CD5 antigen is a single-chain transmembrane glycoprotein with a molecular weight of 67 kDa. The extracellular domain consists of 3 scavenger receptor cysteine-rich (SRCR) domains of approximately 100 amino acids each. CD5 is found on all mature T lymphocytes and on most thymocytes. 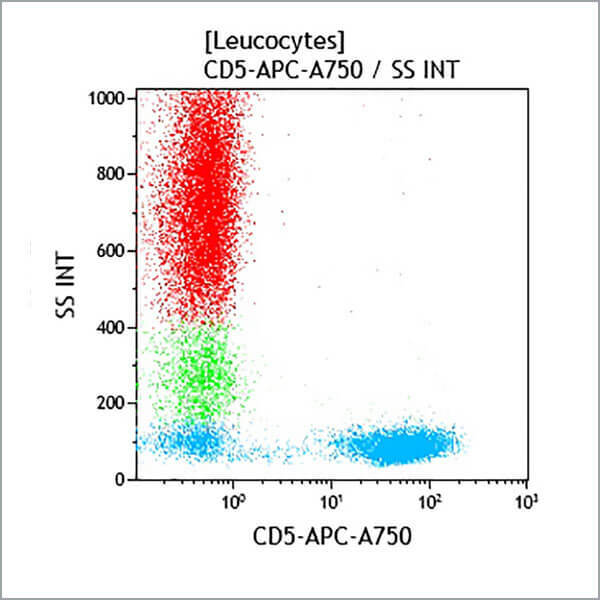 CD5 is also present on a B lymphocyte subset but is not found on granulocytes or monocytes. CD5 is a ligand for the CD72 antigen, which is present on B lymphocytes. The CD5+ B lymphocyte subset (known as B-1a lymphocytes) may arise from a non-conventional B lineage (independent of bone marrow). *Alexa Fluor and Pacific Blue are registered trademarks of Molecular Probes, Inc.